, we can’t wait to visit this land again. There are so many beautiful places Indonesia. Like for example Java (world’s most populous island), Raja Ampat or Sulawesi. We asked our friends and fellow travel blogger to take part in this collaboration post. Each of them shared their favourite destination in Indonesia. After seeing all these incredible photos and reading their texts, we really can’t wait to visit this country again! Raja Ampat is an archipelago located off Bird’s Head Peninsula and is part of Indonesia. 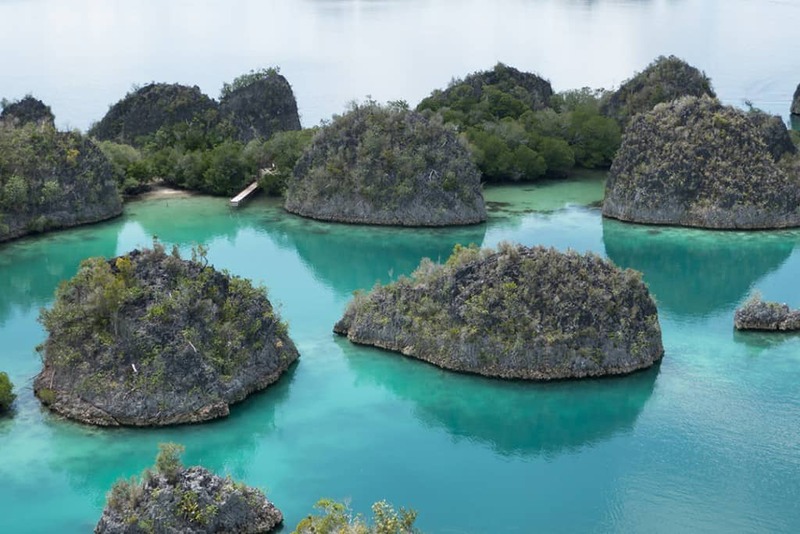 What makes Raja Ampat so special is that it is off the beaten tourist park and is an unspoilt eco marine park. We have never seen waters so clear and so beautifully coloured. Raja Ampat is a popular destination with divers, and they also have an amazing homestay program where the locals try and look after their own environment. You will not find large resorts here, and therein lies its attraction. It is a pristine location. Jakarta may not be the first place to pop in your head when you are thinking about the best places to visit in Indonesia but we found it surprisingly awesome. This mega city is home to a huge range of attractions. 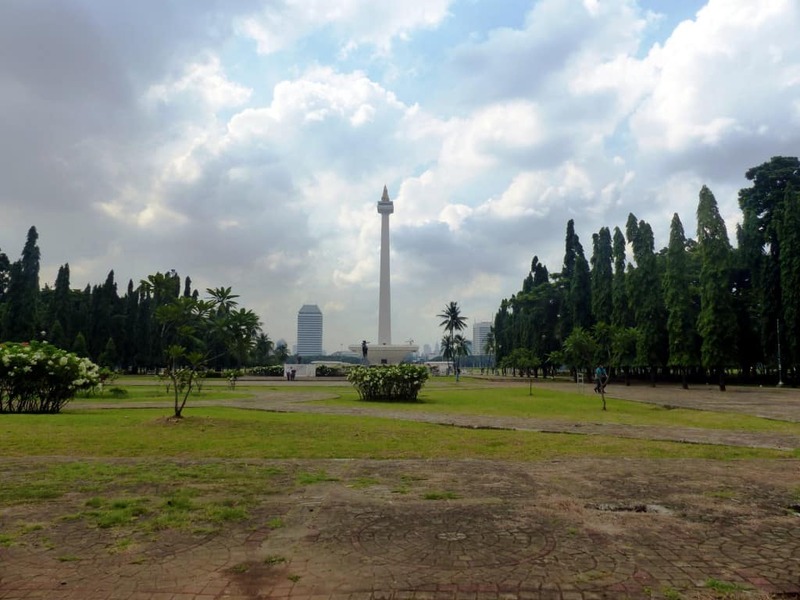 Our favourite things to do were walking around the old Dutch area of Kota and visiting the towering National Monument (pictured). When visiting the latter, make sure you go early on a week day to avoid huge lines. If you like big city atmosphere, museums, Dutch architecture, shopping, nightlife and getting a sneak peak of all the cultures that Indonesia has to offer, don’t just skip over Jakarta but put it on your Indonesian itinerary. If you wish to escape the busy city life of Singapore, Bintan is easily the Indonesian island paradise you seek to discover. Only a short high speed boat ride away from Singapores mainland, you can reach this Indonesian island. Rent a moped, cruise the islands coast and pick which affordable beach huts grab your fancy. Compared to Singapore, Bintan offers a relaxing tranquility that you desire. Enjoy a stunning sunset from your beach hut bungalow and be sure to grab an Indonesian style massage on the beach front. One of the highlights from Bintan was how incredible the seafood on offer was. Affordable and freshly caught on the day, this added bonus makes a visit totally worth it for seafood lovers to the island of Bintan. Living in Bandung, Indonesia for 11 months was an experience of a lifetime. With mountains, volcanoes and greenery all around, this city is a great place to live. 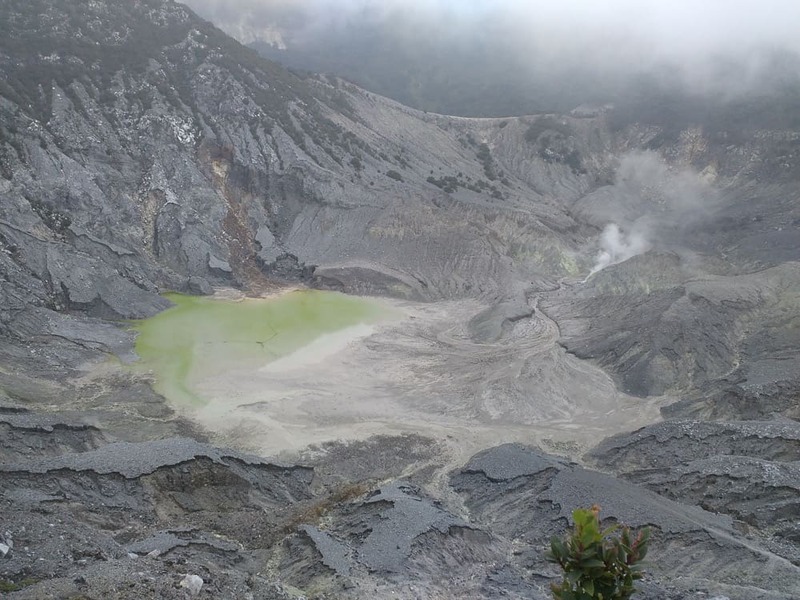 One of my favorite places is the volcano Tangkuban Perahu. It is an active volcano set amidst outstanding scenery, located about 25 km north of Bandung, via Lembang and makes for a great day trip.When viewed from Bandung, the volcano seems like an upside down boat, thus giving it the name Tangkuban Perahu, meaning up-turned boat. 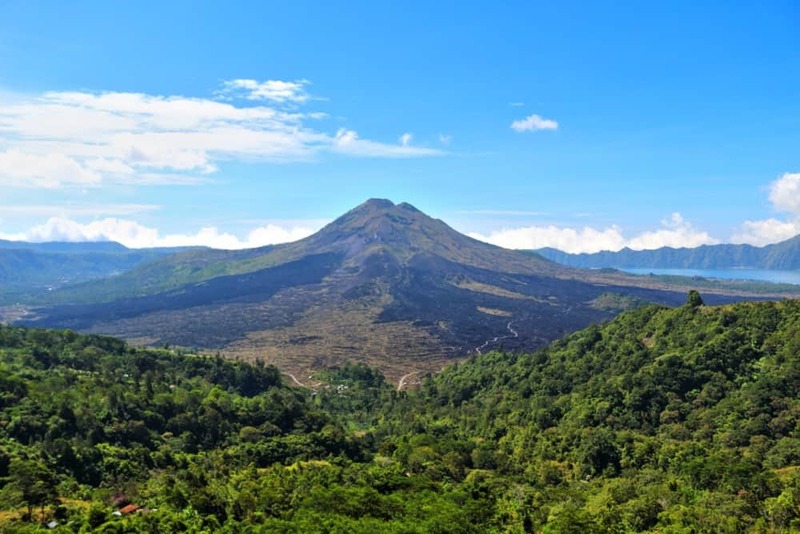 Indonesia has no shortage of mountains and volcanoes to explore, and this 2084 metre high volcano is one of Java’s most popular attractions, both among tourists and locals as well. The mountain last erupted in 2013, but judging by the ash clouds released recently, another eruption may be near. So go visit it while you still can. For something a little different from the craters, dive sites, and wildlife that comprise Indo’s glorious natural appeal, head to Borobudur in central Java. 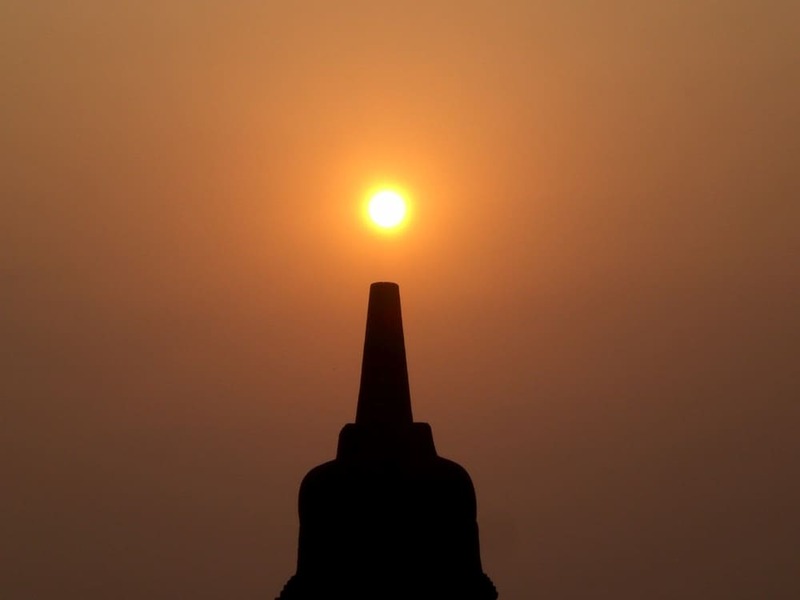 Borobudur is a Buddhist stupa and temple – the largest Buddhist structure in the world, in fact. The size and detail of this temple complex are overwhelmingly impressive. Borobudur is easily accessed from Yogyakarta. Be sure to purchase a sunrise ticket from the Manohara Resort, which lets you access the temple at 4:30am before the general public. Even if the sunrise is a dud, it is very worth paying for early admission so you can enjoy the temple while it’s quiet and near-empty. I love archeological sites, and scout for them in whichever country I visit. 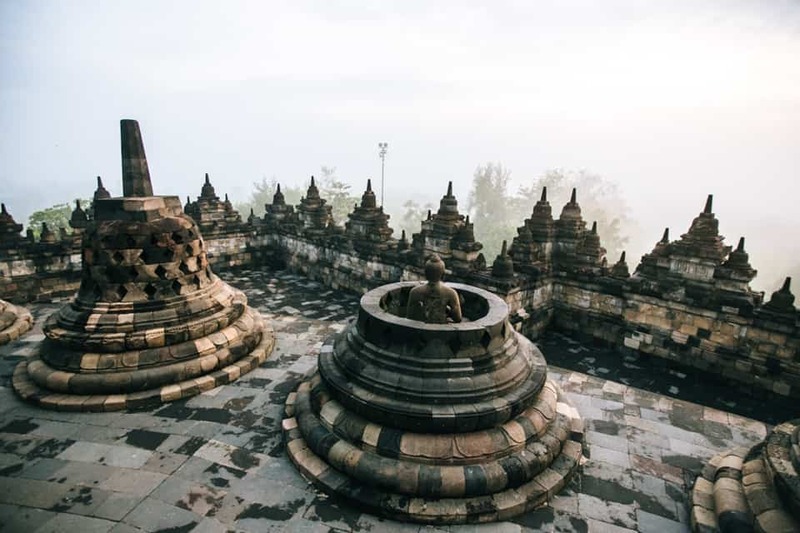 I was thrilled at the idea of visiting Borobodur, in Indonesia, and even more excited as I would have the opportunity to see the sunrise from it. This implied waking up at 3:00 am to drive all the way to the site. When I got there, it was still pitch dark and I needed a torch to climb all the way to the top. Little by little, the light started changing until the sun eventually popped out, and the view was simply splendid. The entire site glowed, a few Buddhist monks sat around, meditating. It was definitely worth the effort! The Dieng Plateau is a caldera complex that sits high up in the mountains of Central Java. The mist-shrouded region is covered in potato and tobacco plantations that lie draped over the area’s lush, mountainous landscape like a patchwork quilt. 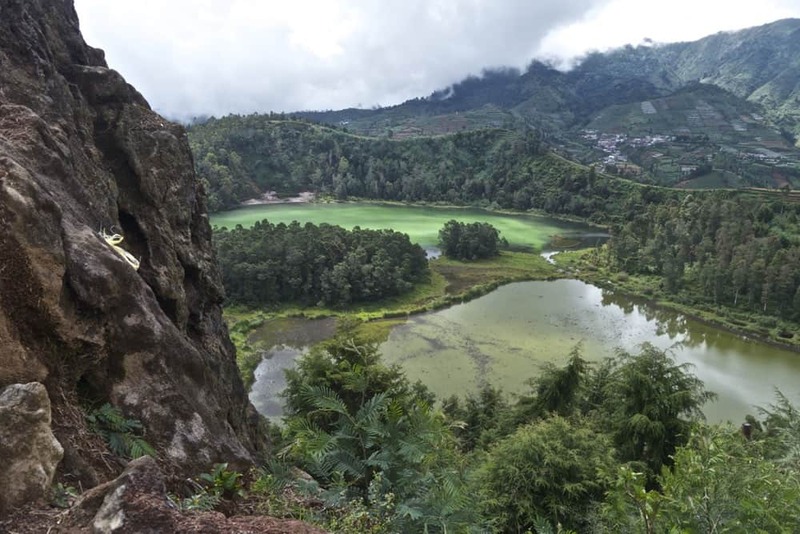 The Dieng Plateau is home to craters spewing sulphuric gases and to some of the oldest Hindu architecture in Java. There are more than 400 temples—most dating from the 8th and 9th centuries—that sit nestled in the verdant scenery. An undeniable highlight of the area is the scenic hike around Mirror Lake and Color Lake. The hike affords spectacular vistas of the two adjacent lakes and their mountainous backdrop. And the cool, crisp mountain air is a refreshing break from the muggy heat that characterizes much of the area’s tropical surroundings. Though the Dieng Plateau can be organized as a day trip from Yogyakarta, travelers may prefer to break up the long journey to and from the plateau with an overnight stay in Wanosobo. The Ijen crater, on the Indonesian island of Java, is mostly known as the Blue Fire crater. 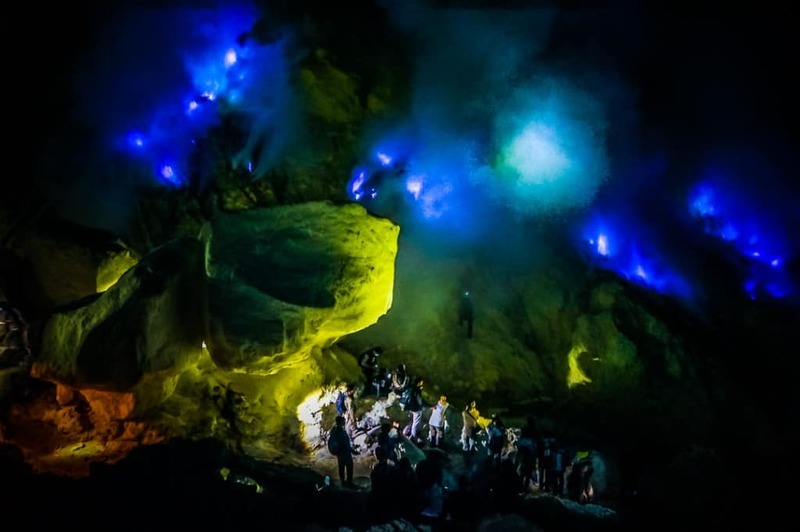 The ‘blue fire’ is ignited sulphuric gas which emerges from cracks at temperatures up to 600 degrees Celsius and to see it you need to hike up the active volcano in the dark. Miners have been extracting sulfur here for more than 40 years under extremely hard working conditions which you can experience first hand when you visit. 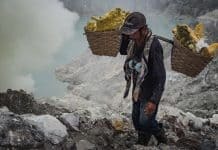 Ijen Volcano Crater is one of the most attractive and dangerous places in the world, so be careful and make sure you wear a respirator that filters out the deadly gasses! Families in authentic Penglipuran Village in Bali, Indonesia, are paid by the government to open their traditional homes to tourists, permitting the opportunity to see how people in this Balinese village actually live. Though interacting with the residents is difficult without a translator, it is fascinating to see someone’s backyard–which is much like a tiny farm–and view the plants and animals that are kept there. I saw pigs in a concrete sty and chickens running loose. A large, quiet temple complex is a short walk up the hill and also makes an interesting visit. Should you not be properly dressed, sarongs are available to borrow. When you’re planning your vacation to Indonesia you must put the Ubud Monkey Forest i on your Indonesia bucket list! Most tourists spend a few days in Bali and make the trip up to Ubud for either a day trip or possibly a few nights. 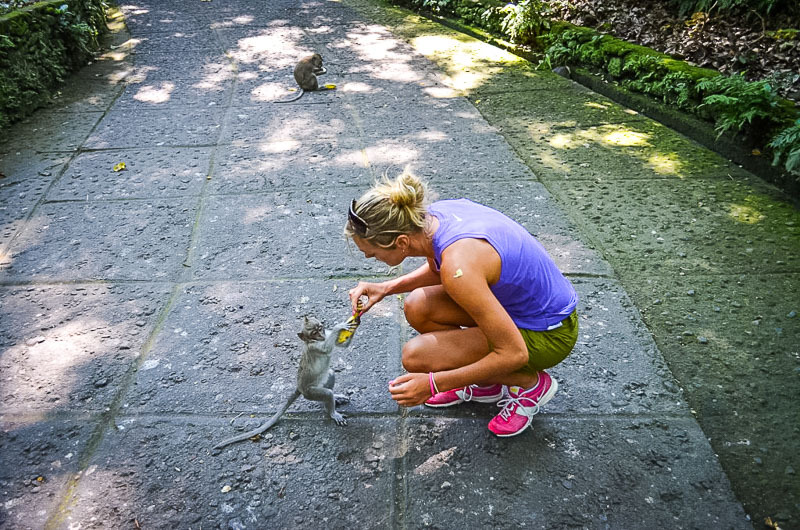 We took a day trip and stopped by to say hi to the cute BUT naughty little monkeys at the Ubud Monkey Forest. These little guys can get out of hand so try and not get tricked it buying bananas before entering as if you do the monkeys will literally be crawling up your legs. I speak from experience! 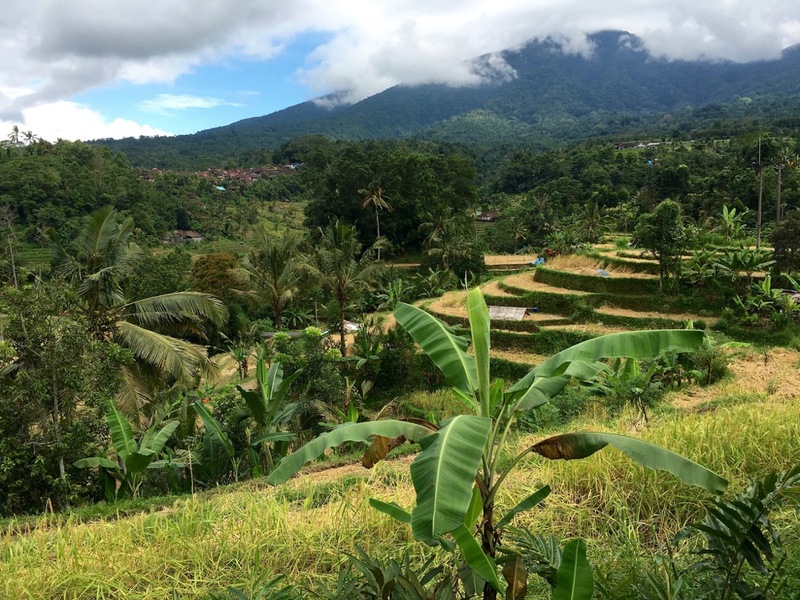 Forget about the crowded tourist resorts and bars around the Bali coastline, it’s deep inside the centre of Bali that its real heart and one of the highlights of a visit to Indonesia is to be found. Stop by the Pura Ulun Danu Bratan water temple at Bedegul (it may be familiar to your from the 50000 rupiah note), trek across rice terraces such as at the World Heritage listed Jatiluwih Terraces, and don’t miss out on visiting one of the beautiful waterfalls, such as Gitgit Waterfall, surrounded by forest and mist. We were surprised to see a volcano on Bali island! We were expecting beautiful beaches, yoga resorts (that’s why our budget for Bali was big) and other hideaways of hustle and bustle of the modern world. Mount Batur is one of the best mountains that we have seen in South East Asia. It is situated in northeastern Bali. It is an active volcano, so we wouldn’t recommend trekking there. It is great to see it from the neighbouring mounts though! 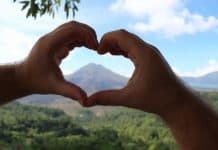 If you are looking for an interesting ideas of spending an afternoon in Bali, you should visit Kintamani or Sari restaurants to see a breathtaking view of Mount Batur! Indonesia’s Sulawesi is yet to receive mass tourism to the island, making it an untouched wonder for those who travel beyond Indonesia’s hot spots. One of the cities on the island, Palu, really stole my imagination despite the short visit. With the heat of Indonesia (less than 100km from the equator) making an active life during the day tough, it was awesome to see the locals heading to the waterfront as the temperature started to cool down as sunset was counting down. It made for a fun and friendly atmosphere, one that keeps you coming back night after night. I’m going to go out on a limb and say it’s a trendy town with street stall owners full of personality and the one cafe I visited was colourful with lots of creativity on the walls. Knowing there’s hiking available nearby, it’s a city I would love to return too. Sulawesi is an Indonesian island that isn’t overcrowded with tourists yet. One of the cities on the island, Palu really stole my imagination despite the short visit. With the heat of Indonesia making an active life in the day tough it was awesome to see the locals heading to the waterfront as the temperature started to cool down as sunset was counting down. I’m going to go out on a limb and say it is a trendy town with street stall owners full of personality and a cafe I visited instantly making me feel quite at home and knowing there’s hiking available nearby, it’s a city I would love to return too. Sulawesi island is one of more than 17 000 Indonesian islands, 11th largest island in the world. Beside beautiful upland nature, authentic building architecture, Tana Toraja area which is located in the South part of Sulawesi is famous for unique funeral procession where buffalo and pigs are sacrificed, organized “death walks”. 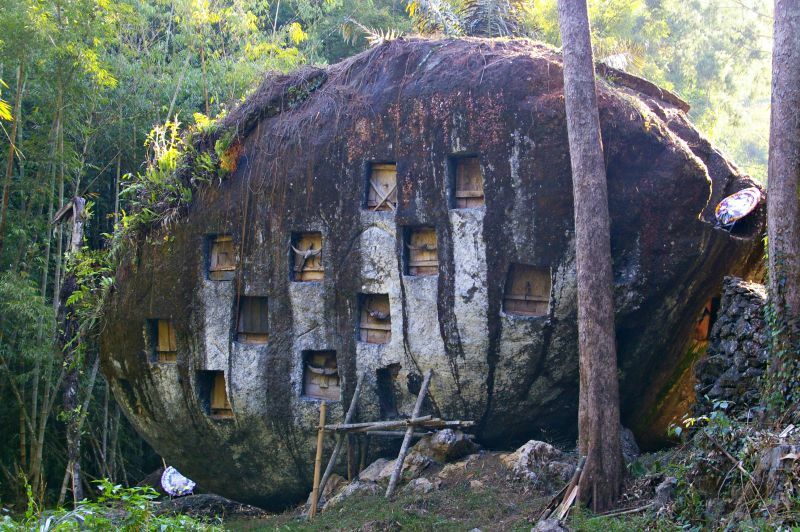 As well Toraja people has very specific burial places – hanging graves in the cliffs, cave graves which are guarded by death people wooden effigies “tau tau”. You should visit Tana Toraja to discover totally different understanding of death meaning, afterlife and see by yourself these old burial traditions. Manado, the capital city of Northern Sulawesi, is a great base for exploring the region and a wonderful destination for nature lovers. Very diverse area that offers everything from mountains, through jungle walks, animal watching to snorkeling. Bunaken National Marine Park is a must visit if you want to see a stunning underwater world – coral reef, colourful marine life, warm tropical waters and turtles. Located offshore from Manado, it can be easily reached by motorized boat. 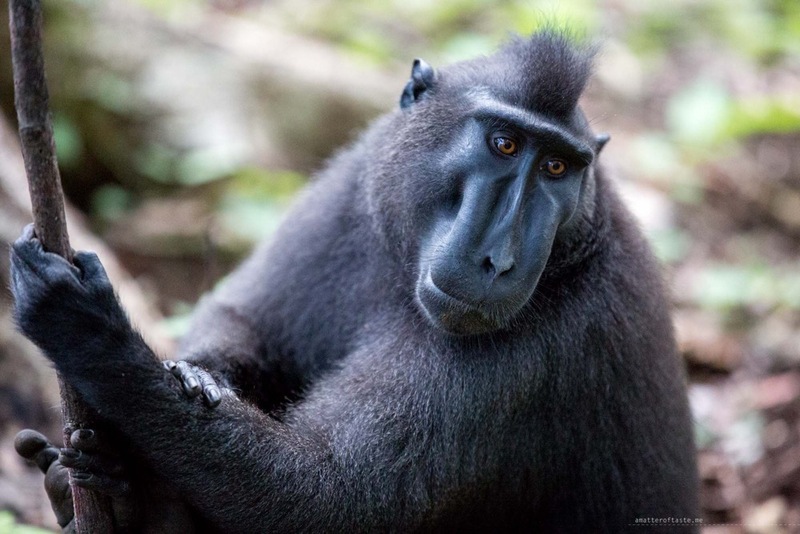 Located at the foot of Dua Saudara Mountain, Tangkoko National Park is the place where you can see black crested macaques, tarsiers and black sand beach. If you’re also interested in bird-watching, go early in the morning. The drive from Manado takes approximately 2 hours, over steep and narrow mountain roads. Minahasa Highlands area is also worth visiting. Beautiful panoramas of lush mountains, hot springs, the highland Tondano lake coconut plantations and rice terraces. Lunch in one of the restaurants built on the lake is a must! Saparua Island is one of Indonesia’s more unique island offerings, both for its postcard worthy beauty as well as historic significance. The beaches and undeveloped landscape are awe-inspiring, and the genuine warmth of the people of Saparua is a breath of fresh air! And despite Saparua’s small landmass, the island is also abounding with rich culture and traditions. 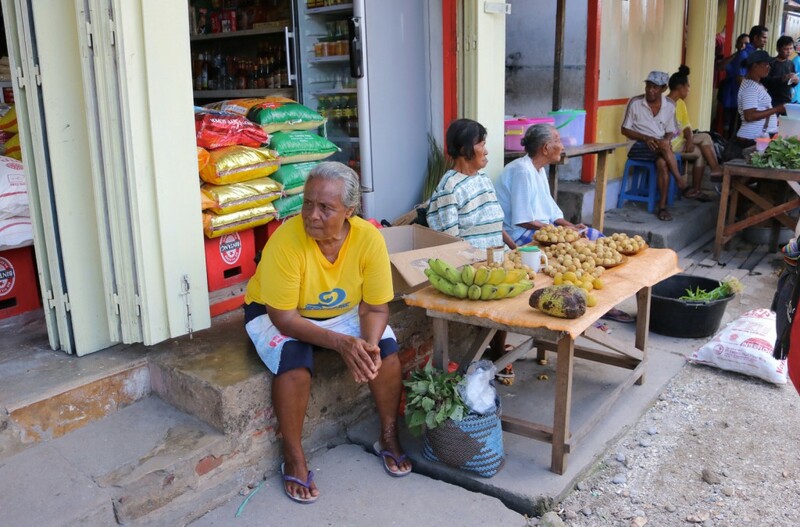 Saparua Island is not only surviving modern times, they are quite sustainable through the community’s own efforts of supporting the local exchange of goods and services. Friendly banter is ongoing as neighbors appear to embrace each other regardless of political or religious preference and that established contentment definitely adds to the relaxed vibe of the island. One of Indonesia’s most laid back destinations is Pulau Samosir, an island in the middle of the largest volcanic lake in the world. The scenery is incredible and the island is home to a friendly population of Christians, many of whom are great singers. 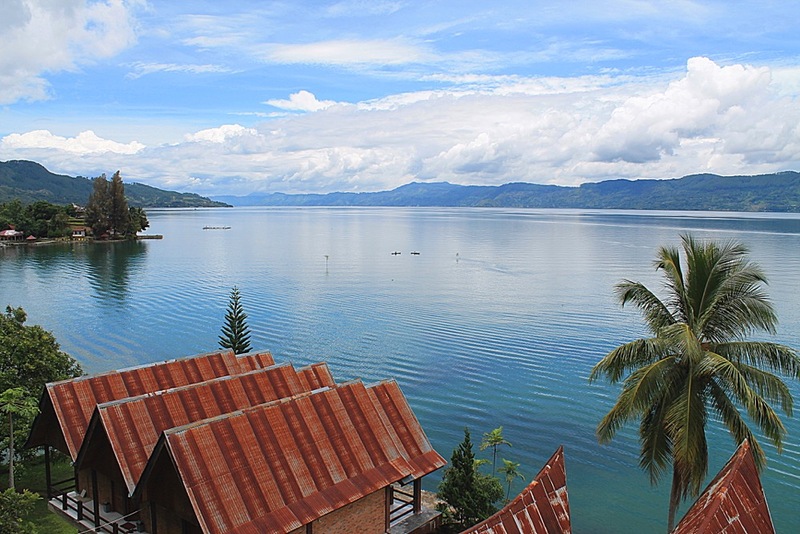 The relaxed vibe makes it one of the best places in Indonesia to stop for a few days, make some like-minded friends (both locals and tourists) and enjoy the views of Lake Toba. You can also explore the island on bicycle or motorbike, check out some nearby waterfalls and get to know the area’s unique history. Did you know that a group of islands in Indonesia gave their name to the large mining conglomerate BHP Billiton? That is right, Belitung gave the company its name thanks to a beautifully rare gem stone that is found only there. But the area is not just a mining zone but also the Seychelles of Asia. 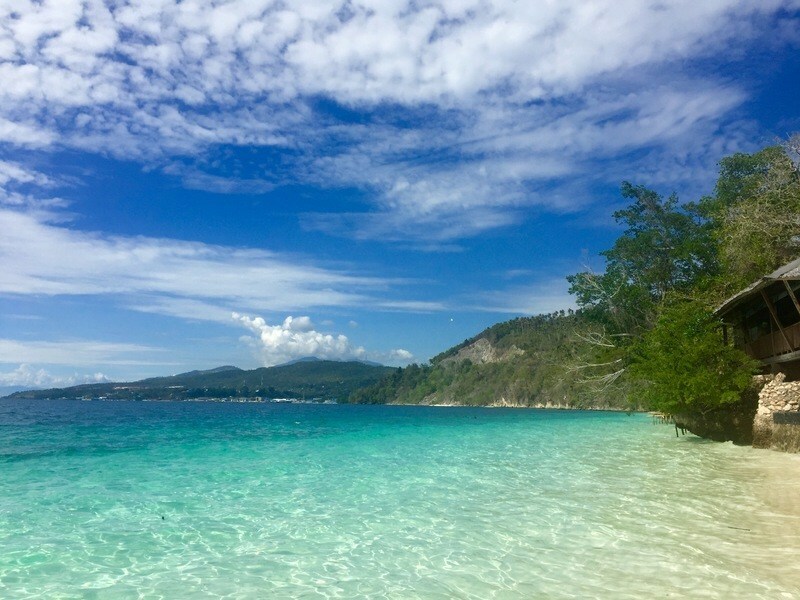 Think beaches dotted with granite boulder rising vertically towards the sky, fine sand and crystal pristine turquoise waters to admire perfect corals reefs. Hop on a boat tour to the many tiny islands and sandbanks, snorkel the warm waters or simply relax under a palm tree with a young coconut in hand. For the more adventurous, there are also large rock formations you can climb which will give you 360 degree views over the beach and the island. 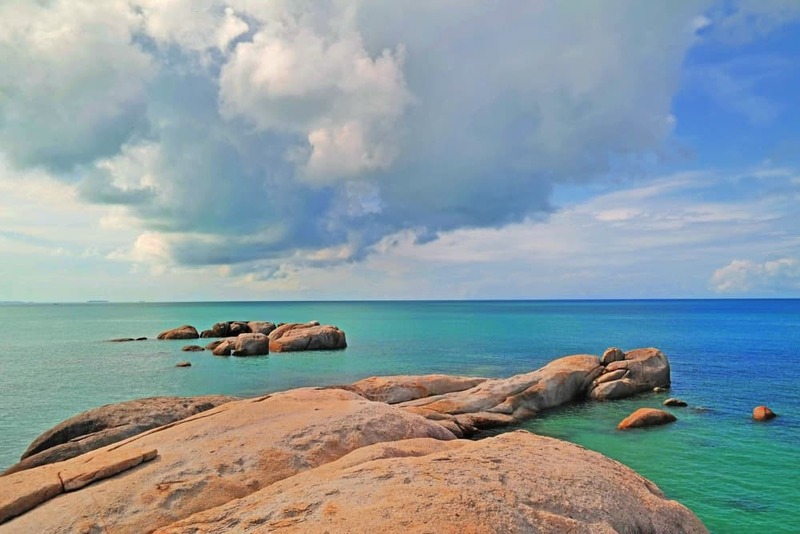 Belitung is the secret tropical paradise you had never heard of. Now, keep the secret to yourself! Indonesia is a waterfall lover’s paradise despite not having the reputation as such. Its many islands are covered with numerous volcanos and most places receive over 200 cm (80 inches) of rain every year. One thing that Indonesia’s waterfalls lack is height though. 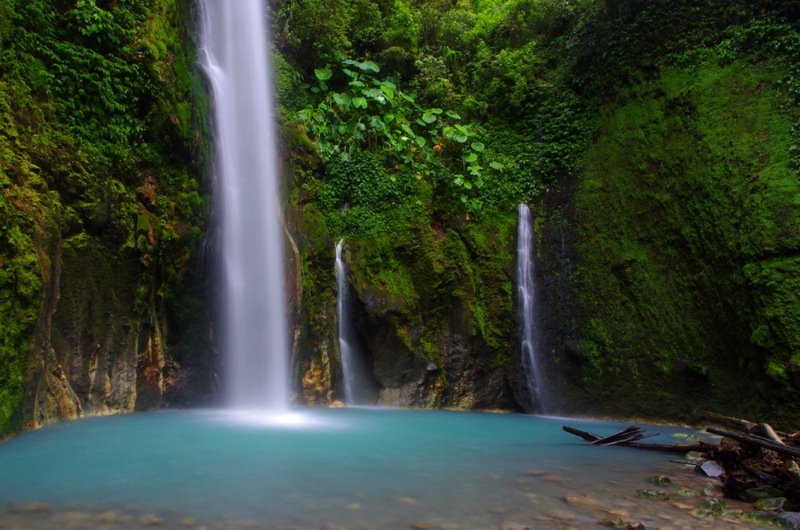 Indonesia only has one waterfall ranked among the top 500 tallest in the world but the combination of rainfall and tropical temperatures combine to create lush vegetation and a feeling of paradise. On my first trip to Indonesia I traveled to Bali like many do. In Bali, Sekumpul Waterfall set itself apart from the rest but I knew that Indonesia offered waterfalls that were even better. After a lot of research I planned my entire vacation this winter around Sipisopiso Waterfall in North Sumatra. In addition to Sipisopiso Waterfall North Sumatra has a lot to offer with Lake Toba, the orangutan sanctuary in Bukit Lawang, the always smoldering Mt Sinabung volcano near Berastagi and the classic batak houses. These were all great places that we really enjoyed but did Sipisopiso live up to its reputation? Sipisopiso Waterfall drops over 100 meters into a pool near Lake Toba. One unusual fact about Sipisopiso Waterfall is that it falls from a cave just below the surface. Like many of the best waterfalls in the world there isn’t much of a hike but you can escape the parking lot crowds by hiking down to the base. This waterfall is just as beautiful in person as it is in photos although the area is similar to most major attractions in Indonesia (vendors…). I didn’t plan to just visit one waterfall on my trip to North Sumatra though. I did a lot of research and ended up going to six waterfalls on my trip. Dua Warna (Two Color) Waterfall in particular stood out from the rest. It is only a 30+ meter waterfall but it falls into the most incredible opaque blue pool surrounded moss covered walls. The name Dua Warna means two colors and according to the guide is in reference to a 2nd clear waterfall that is located 30 meters away and within sight of the main waterfall. This isn’t the end of my waterfall adventures in Indonesia though. I plan on visiting one new place each year and Lombok is next on my list. will give you the opportunity to see a traditional dance the Sahureka-reka or out to Liang Beach to see the Bamboo Gila Dance (this are organised my iLMi Tour). I would also recommend taking a day trip to one of the neighbouring islands, like Saparua, by speed boat. You could spend the morning at the markets and then head out to Fort Duurstede for a good history lesson and views of the island. No matter where you are, snorkelling is a must. The ocean is beautifully warm and abundant with sea life. In regards to accommodation, I would highly recommend stay at The Natsepa. They have an infinity like pool with a swim up bar that overlooks the ocean, what can get much better than that? Should I mention the other private pool out by some of the hotel rooms? Or about the foot reflexology you could get as you look out over the ocean? Bliss. 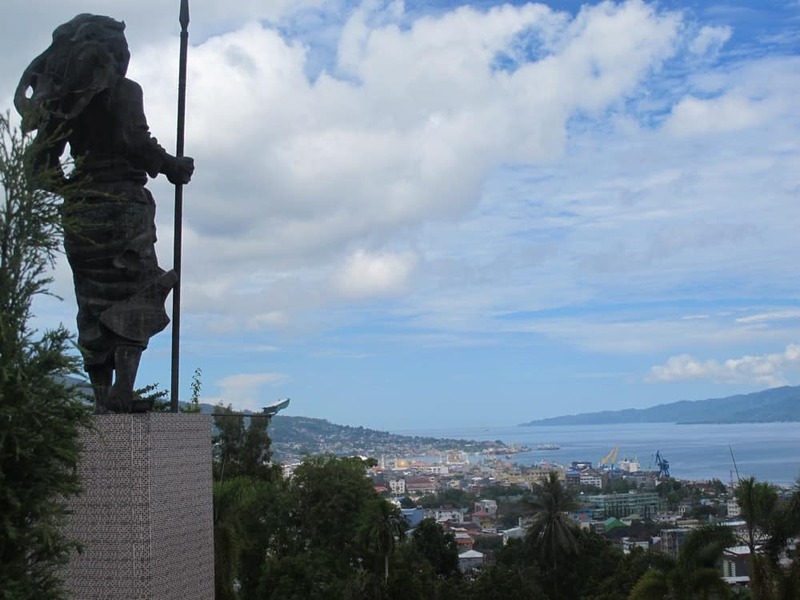 Ambon is a yet to be truly discovered part of Indonesia, so don’t miss it. 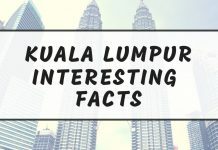 Which of these places would you like to visit the most? Do you know any other awesome destinations in Indonesia? Remember, sharing is caring! Share your thoughts in comments! Previous articleHow to bargain in Vietnam? Best tips. Wickedly well put together Karolina. I think Java is going to be the spot I freely explore. Having only been to Jakarta, it seems to have a bit of everything. While some of the other spots look amazeballs, it’d be handy not to have to get a plane to cover lots of places. And the crazy thing about Java is how few western tourists there are, except at Yogyakarta and Mt Bromo! We spent a night in the city of Malang, and only saw one other white face the first evening (and American teacher living there with his Indonesian girlfriend). This is a beautiful post. 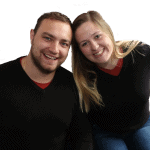 Thanks for including us. Looks like I have to go back! Thanks so much for including me, I loved my recent trip through Indonesia and there’s still so many islands that I have to visit there! 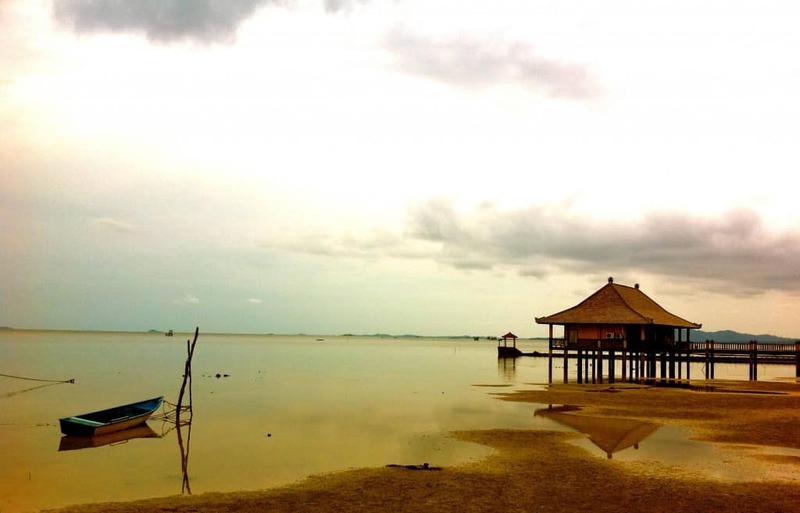 In java you are missing couple of places quite unknown by tourists. One is Green Valley and the other Green Canyon, both worth the trip to see them. Hope you check them out and don’t leave them out of your list. Completely agree on Raja Ampat! Best place we have been ever! Thanks for the tips, Marc! Indonesia has so many beautiful places that it’s almost impossible to write about all of them. We haven’t been to Java yet but we will visit Green Valley and Green Canyon next time we’ll be visiting Indonesia :). Amazing post Karolina, all these places look so beautiful and different from what I know. 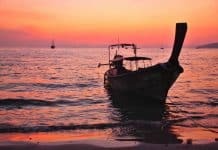 I can’t wait to be able to afford a round trip around Asia and islands! Hey, there, I have learned so many amazing and outstanding things about Indonesia! Thanks for all of the good resources. Long time I am looking information about this amazing places. Keep it up dear!